Synopsis: A beautiful and distinguished family. A private island. What I Thought: OH MY LORDY. THIS BOOK. THE FEELS. THE TEARS. So when I started reading this, it took me awhile to realise what the actual heck was going on. This book is set into parts, then smaller chapters, switching between present and past, and can be confusing if you don't follow carefully. It has been said that it's best not to tell you anything about the books ending, and it's absolutely true. This is a book that you just need to dive in without knowing anything about it - that is what I did and the end just blew me away. Cadence is part of a group called the Liars - three of them cousins and one a long time friend. Together they spend their summers on the family island, living the life of luxury that money provides. One summer, Cadence has an accident and can't remember what happened, and now it is time for her to regain her memories. 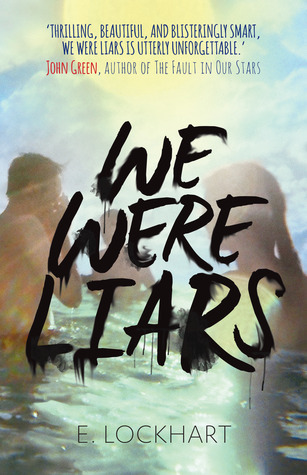 We Were Liars had a bit of trouble holding my interest in the start, and for a long while I couldn't figure out why everyone liked it so much. However the need to find out the ending was too strong and I had to finish it - and I'm so glad I did. Lockhart has written a cleverly hidden twist, to which I never saw coming. Not by a long shot, and that alone, makes this book completely worth it. I can't wait to reread it again, knowing the twist and seeing how well it was written into the story without my noticing. All in all, a fantastic novel that everyone needs to read! The Good: That twist ending!! The Bad: It is a slow start, and a lot of it doesn't make sense for awhile. I recently read this one and I did not like it. I think the twist at the end was the only thing keeping it together and I figured out what was happening about a quarter of the way through the story. I just continued to read to see if I was right. I have to admit though, that I was moved to tears when all was revealed. It was all very very sad. I am glad you enjoyed this more than I did. I think I would have liked it a lot more had I not known what was going on.